(Saturday, October 1, 10an) In addition to the two Royal Caribbean sailings we covered yesterday, Carnival has now decided to reroute two ships to avoid Hurricane Matthew. Carnival Splendor's six-night western Caribbean cruise from Miami on October 2 was scheduled to go in a clockwise pattern around the western Caribbean. Carnival has rerouted it to go the opposite direction, but visiting the same ports. It will now visit Cozumel on Tuesday, Grand Cayman on Wednesday, Ocho Rios on Thursday, and Carnival will add a call at Freeport on Friday. Carnival Sensation's five-night cruise to the Bahamas and Grand Turk on October 1 is now going to the western Caribbean visiting Costa Maya (on Monday) and Cozumel (on Tuesday). More changes will likely follow. As storms go, Hurricane Matthew has been relatively well behaved. It's stayed out of the way of most cruise ships and hasn't been particularly strong. Suddenly, however, Matthew has strengthened to a Category 5 storm - the first in the Atlantic basin since 2007 - and it is getting ready to turn northward from its location off the Caribbean coast of South America and move rapidly up north. By Monday it is forecast to pound Jamaica while still at Category 5 strength, then cross Cuba and by Tuesday afternoon and Wednesday move northward through the Bahamas. At this point, it shouldn't directly affect South Florida as it passes. So far, only one line has told us of their plans to move ships out of the way. Other lines should be expected to follow suit by Monday. Details appeared in the September 30 edition of Cruise News Daily. The show backstage in the Two70 lounge and showroom aboard Royal Caribbean's Quantum-class ships may be as fascinating as the one on stage. That's because technically there is no BACKstage with this stage. “Backstage” in Two70 is below the stage and above the stage. It's part of a new format of entertainment created for this class of ship that includes live action from a cast of 18 performers, a 12K 115-foot by 23-foot high video screen and six robotic video screens. The complete story appeared in the September 30 edition of Cruise News Daily. Video courtesy of Royal Caribbean International. All rights reserved. Remember sailing on the Sunward? Remember before they were Norwegian Cruise Line, they were Norwegian Caribbean Line? Do you remember what you were doing on December 19, 1966? That's when Norwegian's first ship, M/S Sunward, sailed from Miami, and NCL (as they were also known then) was born - 50 years ago. And they want everyone to stroll down Memory Lane with them. Details appeared in the September 29 edition of Cruise News Daily. Puerto Rico is making a comeback in the cruise industry. After 9-11 when flying got lots less convenient (and much more expensive), people wanted to embark on their cruise from somewhere closer to home, and often, somewhere that was only a short drive, so Puerto Rico fell out of favor as a port of embarkation. Cruisers are again wanting to broaden their horizons, and they want the type of itinerary that are available by sailing from San Juan. And cruise lines are responding. The complete story appeared in the September 29 edition of Cruise News Daily. There was a small fire aboard Norwegian Joy in the Meyer shipyard (in Papenburg) on Wednesday. With it there was a lot of smoke. Shipyard firefighters responded and were able to quickly extinguish the blaze. There were no injuries. Silversea Cruises announced their 2018 program today, and it seems that there is nowhere on earth a Silversea ship isn't scheduled to go in 2018. The nine ships will visit 130 countries on all seven continents and almost 1,000 ports. Three hundred will be new to Silversea. The complete story appeared in the September 28 edition of Cruise News Daily. Photo courtesy of Holland America Line. All rights reserved. May not be copied or used without express permission. What's Carnival Doing in China? Carnival Corp had their quarterly conference call to discuss their earnings with financial analysts yesterday. As usual, they made a ton of money (the highest quarterly earnings in the company's history), but that's not what we normally cover in CND, so suffice it to say they are in good shape and will still be in business when you take your next cruise. But not all the discussion is strictly financial. There's a lot of discussion about other subjects, and usually a theme appears in the questions. This month it was about capacity in China and how rapidly the industry will expand there. Surprisingly, while there is enormous potential, Carnival indicated that it will be measured growth. The complete story appeared in the September 27 edition of Cruise News Daily. This video takes you behind the scenes at Royal Caribbean's center for crew safety training near Manila. Royal Caribbean hires more crew members from the Philippines than any other single country. Crew members from the region go there for training either as new hires or when they need to renew their basic safety training. About 80% to 90% of all Filipinos crew members go through the facility. Up to 3,000-4,000 people per month can be trained there, which will be useful as Royal Caribbean expands from about 11,000 crew members up to about 30,000. This article appeared in the September 27 edition of Cruise News Daily. Video courtesy of Royal Caribbean International. Celebrity Cruises has a message, and to make sure it gets seen, they are putting and ad for it in the most visible place they could think of - in tonight's US presidential debate. Networks estimate more than 100 million people will tune into the debate. Of course, sometimes this strategy works and sometimes it doesn't. Just because a zillion people (slightly more than 100 million) tune it doesn't mean they will watch the commercials during the limited number of breaks. They could be so glad to see a break they immediately leave the room to do other things. Still, out of an audience that size, only a small percentage of them watching is still a large audience. What is this message? It's the first part of their new global campaign entitled “Sail Beyond Borders,” which carries the message that “the world is better without walls.” Of course the idea is that you visit these “Far Away” (the title of the first ad) places on Celebrity Cruises. Details appear in the September 26 edition of Cruise News Daily. Video courtesy of Celebrity Cruises. All rights reserved. The US Coast Guard medevaced a 47-year-old man from Ruby Princess late Friday night when it was nine miles southwest of Point Loma near San Diego. They received a call from the ship at 11:35pm reporting the man, who was a crew member, was experiencing symptoms of a heart attack. By 1am, an MH-60 Jayhawk helicopter crew had been launched from the Coast Guard station at San Diego, and by 2:05am, they were over the ship hoisting the man up to the helicopter. 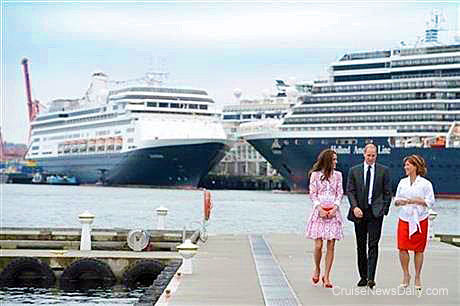 The complete story appeared in the September 26 edition of Cruise News Daily.